20TH-31ST JULY 1915: HILL 60 UNDERGROUND WARFARE & CRATER FIGHTING. HIBBETT LETTERS, written in the Trenches on S.W. Slope of Hill 60, between 20th and 31st July, 1915, have not survived. Pte Bertie Hibbett had been anxious about the safe arrival of his Letters Home for some time and they may have been lost in the heavy shelling & direct hits 1/5th S. Staffs experienced in late July 1915. His Whizbang Dugout’ was probably in Trench 37, on the west side of the Ypres-Comines Railway Cutting. 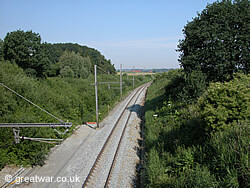 Ypres-Comines Railway Cutting looking south, built in 1860s, with Hill 60 spoil mound on left & Caterpillar spoil mound on right. On 17th Feb. 1915, the first British mine was blown up under enemy lines on Hill 60 by RE of 28th Division. Wherever the geology was suitable, a new type of siege-warfare was being developed. Pte Bertie’s knowledge of mine-surveying was about to be called on by the Army. His Listening Post duties in undergound tunnels & chambers would have involved working with 172 Tunnelling Company RE.(1). He would probably have met them again at Neuville St Vaast in 1916. In his ‘Memories’ he describes the tactics used in what became known as Crater Fighting. The Revd. Arthur H. Hibbett. c 1967. My Memories of the First World War. 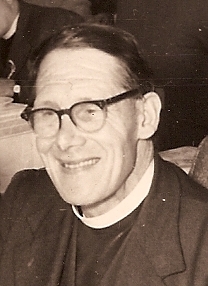 The Revd A.H. Hibbett. 1967. ‘I shall never forget my experience at Neuville St Vaast, . . . when I went with a party underground to listen for the enemy tapping their way in underground passages towards our Front Line. It (was a) dark night which made it all the more ‘exciting’. Whose mine would go up first, theirs or ours? Our feelings were indeed tense. “Pass the word down for Bomber Ford”, came the command from the officer in front of our column, as we lined up to throw hand grenades over the parapet. “Pass the word back I aint,” retorted Bomber Ford from the rear. The German mine went up first – and we tried to occupy the crater before the enemy advanced to take possession of it. It is strange to think that I might have thrown one of my sister’s hand grenades at Neuville St Vaast. NB This was one of the very few stories of the War my father told me as a child. cf. website The Long Long Trail. The Tunnelling Companies RE. S.W. SLOPE OF HILL 60. 20th July,Tue : Enemy shrapnelled 37 Trench, 2 direct hits on parapet. All explosives, except one cylinder containing black powder and one wooden box of LIGNOSIT(2) explosive, removed from mine. Amount now recovered is approx 1250 lbs. SW wind. CASUALTIES: WOUNDED: No 9287 Pte J. Beech. 21st July, Wed: Exceptionally quiet day. RE unable to remove cylinder and box of explosives, because of fumes but have cut all wires leading to the charge, and are now continuing work on own gallery. SW wind. Eight Officers of New Army attached for instruction. Relieved by 6th North Staffs about 11.45 pm. 22nd July, Thur – 26th July, Mon. 27th July, Tue: Relieved 6th North Staffs in trenches at 10.30pm. ‘B’ Coy. and Machine Gunners of the 8th Bn South Staffs (3) attached for instruction. CASUALTY: WOUNDED: No 9838 Pte D. Westwood. S.W. SLOPE OF HILL 60 TRENCHES. 28th July, Wed: Several rifle grenades apparently fired from 38 trench burst between 37 and enemy trench opposite. Enemy retaliated with trench mortar on 37 trench. At about 7.45 am a distinct tremor of the ground was felt, as if a mine was exploded but no report heard (4). About 1.35 pm 35 and 35 Support trench also the wood in the rear was shrapnelled. Enemy aeroplane over our lines about 4.45 pm. Trench Map 28: showing Ypres -Comines Railway Cutting & Spoil Mounds:, Hill 60,, the Dump & the Caterpillar with Larch Wood top left. Grateful thanks to Joanna Legg & Co: The Great War 1914-1918, website. Enemy shelled the Dump (5) between 7 and 8 pm, one of the shells burst over the retrenchment. CASUALTIES: – Nil. 8th Bn South Staffords: 2 wounded. 29th July, Thur: Enemy fired 6 trench mortar bombs into Railway Cutting , between 5.30 and 7 am without damage to our sector. At 8.30 pm enemy fired one H.E. shell into 35 Support. Except(ionally) Quiet Day. CASUALTY: 9072 Pte W. Compson, slightly wounded/ remain on duty. 30th July, Fri: About 3.15 pm two mines blew up about 2 miles away on our left (6). Artillery bombardment commencing at the same time in the same locality near Hooge. At 3.45 am. Enemy shelled our fire and support trenches with H.E. from field guns damaging the parapet of 36 trench. Listening Post in 37 Trench (7) reported sounds like knocking near mine crater during the early morning, nothing further heard during the day. 36 and 36 support trenches shelled from 3.20 to 3.40 pm. CASUALTIES: SLIGHTLY WOUNDED remain at duty: No 9025 Pte A. Teague. 9833 L/Cpl Williams A.G. 8779 Pte S. Pitt. 31st July, Sat: Enemy shrapnelled our trenches from 2.15 am. to 3.15 am, parapet of 35 and 36 trenches damaged. Immediately before the attack started white star shells (8) and red flares were used. Our Artillery replied very effectively to enemy’s shelling. Listening Post reports hearing slight tapping noises near mine crater during the night. Very Quiet day. CASUALTIES: KILLED: 9615 Pte T. Cox. 8298 L/Cpl W. Sherwin. WOUNDED: 9582 Pte L. Bloomer, 9564 Pte H. Batchelor. 8620 Pte J.P. Somerfield. 8852 Sgt C.H. Hammonds, 6954 L/Cpl E. Brown, 9910 Pte W. Siviter, 60 Pte J. Richards. SLIGHTLY WOUNDED/ remain at duty: 8664 Pte A. Reynolds, 7791 Dr R. Taylor, 8182 Pte C. Harding. 172 Tunnelling Coy R.E. WOUNDED: 2 . 8th Bn South Staffordshire 1 wounded. SUMMARY OF CASUALTIES DURING THE MONTH OF JULY: OTHER RANKS KILLED: 7. WOUNDED: 26 . SLIGHTLY WOUNDED/ remain at duty: 10. SELF INFLICTED WOUNDS: OTHER RANKS: 1. DIED OF WOUNDS: 4. (9). (1) 172 Tunnelling Company: first employed in the Bluff & St Eloi /Ypres Salient in 1915 & Neuville St Vaast /Vimy in April 1916. The Tunnelling Companies were involved in ‘digging subways, cable trenches, saps chambers for offensive and defensive mining’. See website: The Long Long Trail, The Tunnelling Companies RE, for further details of this siege-warfare. (2) Lignosit: a German blasting explosive containing ammonium nitrate. Black Powder: name for ordinary gunpowder, mixture of potassium nitrate, sulphur & charcoal. Dictionary of Explosives. Philadelphia.1920. Arthur Marshall. Forgotten Books. (3) 8th (Service) Bn S. Staffs: originally formed for Home Defence. See website: The Great War 1914-1918. (4) Mine explosion/camouflet underground/ hence no sound? (5) The Dump: the smallest of three spoil mounds, created in 1860s when Ypres- Comines Railway Cutting was built. Hill 60 was the tallest, at 60ft above sea-level. <www.ww1battlefields.co.uk> (6) Hooge? (7) Listening Post: report most probably from Ptes Bertie Hibbett, Vernon Evans & their QMS pals. (8) ‘White star’ shells : could be marker flares for German artillery, but phosgene-chlorine poison gas mixture was also called ‘white star’ by Allies, because of marking on shells. (9) Self-inflicted wounds caused death of 4 out of the 5 South Staffs soldiers reported in July 1915; an indication of the terrifying mental and physical pressure they were under. NEXT POST: 1st August 1915. Hill 60. Whizbang Dugout. 172 Tunnelling Company RE.8th Bn South Staffs.Black Powder.Crater Fighting.Lignosit Explosive.Red Flares.Self-inflicted wounds.White star shells. S.W. SLOPE OF HILL 60. TRENCHES: 35, 36 & 37 with their Supports. 17th July Sat: Relieved 5th Leicester Regt. Trenches 35, 36, & 37 with their Supports about 11.45 pm. 18th July, Sun : V Quiet day. Enemy aeroplane appeared hit by Anti-aircraft guns, descended quickly behind German lines. Howitzer battery (1) fired with good effect on enemy trenches on our left at 9.00 pm. N. W. wind. CASUALTIES: KILLED: No 8536 Pte. J. Wilkinson. WOUNDED: No 9709 Pte W. Ball. 19th July, Mon: RE reported having bored through to enemy mine in gallery in front of 37 Trench. No working was heard from enemy mine. Our Listening (2) near old mine crater reports all quiet. Enemy shrapnelled old 35 communication trench about 12.5 pm. RE removing explosives from enemy mine. S.W. wind. Pte BERTIE HIBBETT: LETTER to Arthur Hibbett & Marie Neal Hibbett. 95, Foden Rd. Walsall. It is a lovely sunny evening with beautiful blue sky & fine with white clouds. Just before tea – no about 3 o’clock, I went to Sydney’s dugout, a very comfi one in comparison to others. If it could have some green baize round the mud walls it would compete with an officer’s. Sydney had all his picture PCs hung up over his head. We had a nice little talk with Charlie Harrison* (Dad’s clerk) and an NCO chum of Sydney’s, Clive Hammonds* of Lloyds Bank, a sergeant; – he was relating what he had heard from a Sergeant Major about the War. Piccalillie Advert. 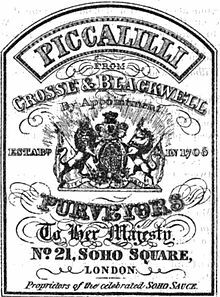 Crosse & Blackwell 1867. Sydney had a tune on his mouth organ & we had some bully beef with some of Harrison’s pickles called Cross & Blackwell’s Piccalle (sic) (3). Then Charlie & I came away to our dugout until tea time – which consisted of little bits of biscuit, gooseberry jam & some butter. For Sunday’s tea I used some of your tea & sugar & we had a ration of milk, the whole making a delicious drink. With Harold’s Mineral Spring Health Granules & his bottle of Lemonade Crystals I can make a lovely morning’s drink. There are two wells in these trenches & we can get as much water as we like up to a certain time at night – ‘Stand To’ I believe. Well I am sorry I have told you so much about our doings so far. I intended starting by saying how delighted I was on receiving your two letters. [While I was at Sydney’s dugout I asked him if he had got any letters, he pointed to his overcoat pocket & I pulled out two letters & an envelope with this note paper in]. Two very nice letters, ones which I was looking forward to as I lay down in my dugout. I had not had one from you since 14th. So the weather was fine at home for my & your birthdays. It rained at breakfast here but turned out sunny & windy & we both had a very enjoyable tea together in Camp. How lucky I was to spend the day at rest – we had come from the trenches during the night & on your birthday we went digging all day. I shall be pleased to get a letter from Ida. I hope she had a fussy welcome at Ashton* & will she go on to York next (4)? Auntie said something about her going there. I pray that Jack Wade* is safe & will be found & that the anxiety in Ashton will not last long. I pray also that Basil will succeed well in his exam & his health will not crash down for Mother & Father’s sakes. You are pleased I am sure that he will be nearer home if the exam is at the Grammar School (5). You will have him arrive sooner to tea and he will spend more time over his breakfast. Dear Mother how very good of you to send a parcel – another one so soon after the two ripping ones. We have demolished all the contents of them & we shall look forward to going back to where the parcels are awaiting us, – with the one from your kind friend Mrs Jones*(6). You will tell me when you get the letters acknowledging your parcels? I guess you got them on the 16th – the day you wrote to Sydney & me. See if you can tell me exactly when you got all my letters from the date I send you the card. By-the- by did you really get that card on your birthday? – if so what luck eh! I say isn’t this letter cramped! – I have put these little bits in since I concluded my letter proper. Did I mention that I gave Leonard Bailey* your generous little gift & he was delighted? Isn’t he a funny chap & he didn’t wish me many happy returns either, but I forgive him, with all my heart I do. How many more Washing Days will it take before I see you all again? Mr Nightingale’s little daughter* used to count by washing days for the holidays to come. My father has covered every available space with his rambling ‘little bits‘ and appears increasingly anxious about receipt of his Letters to & from Home.This Letter was posted in a white envelope; presumably Green envelopes had not yet been issued in sufficient quantity. (1) Howitzer Battery: artillery piece between a ‘gun‘ and a ‘mortar‘; designed to propel projectiles at high trajectories, with steep angle of descent. (2) Listening Post. Pte Bertie Hibbett often volunteered for this dangerous underground duty. cf. Previous Hibbett Letters & A Little Book of Words & Doings. Tunnelling Companies were very active in 1915, laying mines under enemy lines. (3) Piccalillie: English version of an Indian Pickle. Etymology: ‘Paco-Lillo‘ 1578; ‘To pickle a Lilo’, an Indian pickle‘.1694. Ingredients: chopped vegetables, usually cauliflower, marrow, mustard & turmeric. Crosse & Blackwell estab. 1706. cf Wikipedia. (4) Ashton under-Lyne; former home of Marie Neal Hibbett (nee Yoxall). York: former home of Arthur Hibbett. Ida Hibbett is visiting relatives; Jack Wade* (missing in action) is probably her cousin. (5) 95, Foden Rd is about 500 yrds up hill from QMS (now the Girl’s Grammar School). (6) Mrs Jones*. A little bit of oral family history. Apart from being a ‘kind friend’ of my Grandmother, and sending parcels to my father in WW1, I knew nothing about this lady until today when my older brother casually remarked that he thought Mrs Jones came from Ashton under Lyne – and was the ‘Nurse Jones’ who came to help my Mother when I was born. My brother also informed me that I did meet my grandparents before they died in 1940. At 6 months old, the family took me to visit them in Rhyl. But we had to leave suddenly – it was Sept 2nd, 1939, the day before World War 2 broke out. Changing trains at Chester or Manchester, my 8 yr old brother remembers the station crowded with refugees. NEXT POST: South Staffords War Diary 20th July -31st July 1915 will be posted on 20th JULY 2015. 5th Leicestershire Regt.Cross &Blackwell Picalilee.Green & white envelopes.Howitzer Battery.Listening Post.Mineral Spring Health Granules.Tunnelling Companies.Walsall Grammar School.Ypres Salient Hill 60. 16TH JULY 1915: PICTURES & MEMORIES OF HOME. 14th – 16th July, Fri: Bivouacs. Pte BERTIE HIBBETT: LETTER to HIBBETT FAMILY, 95, Foden Rd.Walsall. ‘Bully Beef Bungalow’. Friday July 16/ 15. I must first say how comfi the socks, I mean the khaki socks, were. I don’t know how the grey ones kind Mrs Barrans* knitted feel – for Sydney needed a pair so I gave him those & I kept the soft ones – they are nice and soft too. I thank you so very, very much. How lavishly the gifts were stowed in the parcel & something even in each letter. A bit a cash in Mother’s & what I thought by feeling a pencil but turned out to be a cigarette holder – silver too my word. I was especially pleased to have a letter from Dodger* & I read Corp. Penning’s letter with great interest (& enclose it with this letter as Dodger said he wanted to answer it). We have seen many of the RGA (1) & thought I might have overlooked him. I had a letter from Miss Foster* the same day as Mother’s & it was written on Sunday & posted on Monday. She said that Nottingham had a storm which lasted all that Sunday from 7 in the morning till 9 at night, so all the Midlands must have had the large storm, if not all England. I was going to head this letter ‘Raining’ for the weather here has been unsettled. Well ‘you do surprise I’ – at promising to send us another parcel next week. Harold’s gifts to us both you would like to know – sugar sweets, Bovril, Chocolate, Country Life Cigs, Bottle of Lemonade Crystals, Tin of Mineral Spring Salts (2), toothpaste etc. & a nice long letter. 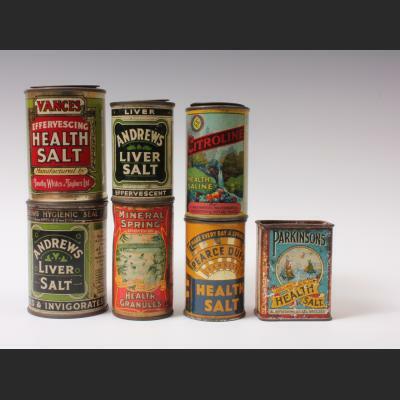 Tins of Mineral Salts. 1915. In my letter to Okoo* thanking him for the parcel I have got confused as to whether I said the same in my letter to Mother. Did I tell you I was delighted with Dad’s few lines at the end & amused at his witty little bits? I often think of you when the post comes to you. Do you generally have our letters in the morning & do you generally breakfast in the dining room? PS Mother will be interested to hear that I got a photo of the kiddies (3) at Sutton today. Miss Bore* sent me some Boardman’s & Player’s bacca & a card of Sutton Keeper’s Pool (4). I recognised the path along the side of the lake, where the kiddies flocked round me & I had to keep a sharp eye on them for fear they fell in. Well goodbye for a time. PS My Dear Dodger, I have just re- read Penning’s* letter. It is now raining miserably & into the tent & I am smoking a pipe of Miss Bore’s bacca to cheer meself up -somewhat like once – (well on the 18th of May I look in my diary, & see we were in camp). We returned from the trenches on previous Sunday night & it was Sydney’s birthday on the Monday we were in camp. As for the 29th of June we had a Route March & saw the pipers & spent most time in camp drilling in full pack. Sir Stuart Wortley* (5) came to see the Reserves – in which is Charlie Harrison*, who’s foot seems quite all right now. We will keep a sharp look out & it will be a hearty hand shake. You will picture us looking up at him on his horse & us squeezing his hand – so if the palm of your hand itches you’ll know that I have nearly rung his hand off see (6). Bertie. PS Looking forward to Ida’s Champion chatty letter. We are always marching, marching – went digging all day again on Thursday & saw Harold Hinde* who is in the Cycle Corps (sic) (7). His brother Cyril*, who has been with us all along, has gone to a Rest Camp. I will stop now – got a lot more correspondence. Bertie. (1) RGA: Royal Garrison Artillery (active 1899 -1924) manned heavy gun batteries attached to each infantry division, with cavalry. After Battle of Marne (Allied Victory, 5-12 Sept. 1914 ) RGA was positioned well behind infantry, firing on unseen targets, often supported by Royal Flying Corps using wireless telegraphy. cf. Wikipedia. (2) Harold the chemist’s gifts of Mineral Salts & Bovril indicate concern at Army’s unhealthy diet. (3) St Paul’s Sunday School Outing, Walsall. 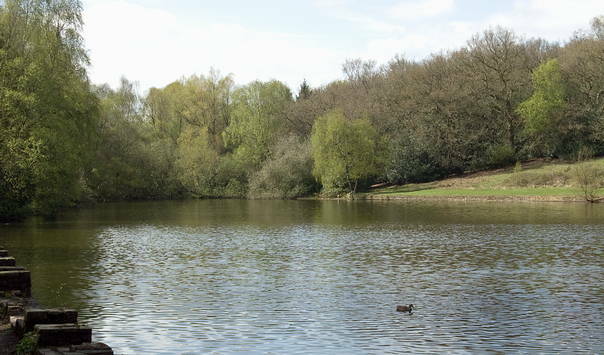 (4) Sutton Keepers Pool. Sutton National Nature Reserve, 7th largest urban park in Europe. WW1 Convalescent Camps in the Park. <www.scnhsc.org.lakes> originally built as medieval fishpond (lido built 1887, closed 2003). (5) Edward James Montague Stuart-Wortley. 1857 -1934. Kings Rifle Corps. Distinguished colonial service. WW1: General Officer Commanding (G.O.C.) 46th Midland Division.T.A. Kept King George V informed re- activities of the Division. Controversely dismissed for ‘lack of offensive spirit’ 1st July 1916, Battle of the Somme. (6) Charlie Harrison*: before War, one of Arthur Hibbett’s clerks in Education Office, Walsall. 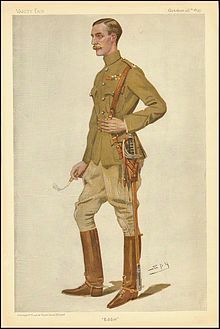 (7) Cyclist Corps : chief role – armed reconnaissance & communication. Also security patrols along canals. See Website Old Sweats Centurion. Often used as manual labour & in Front Line. NEXT POST: 19th July 1915. 20th Birthday Food Parcels20th Birthday Gifts 1915.Boardman's & Players' tobacco.Khaki Socks 1915.Pictures of Home 1915.R.G.A.RGA Royal Garrison Artillery.Sir Stuart Wortley.Sutton Keeper's Pool. 13TH JULY 1915: MOTHER’S BIRTHDAY PSALMS & HOLY ORDERS. 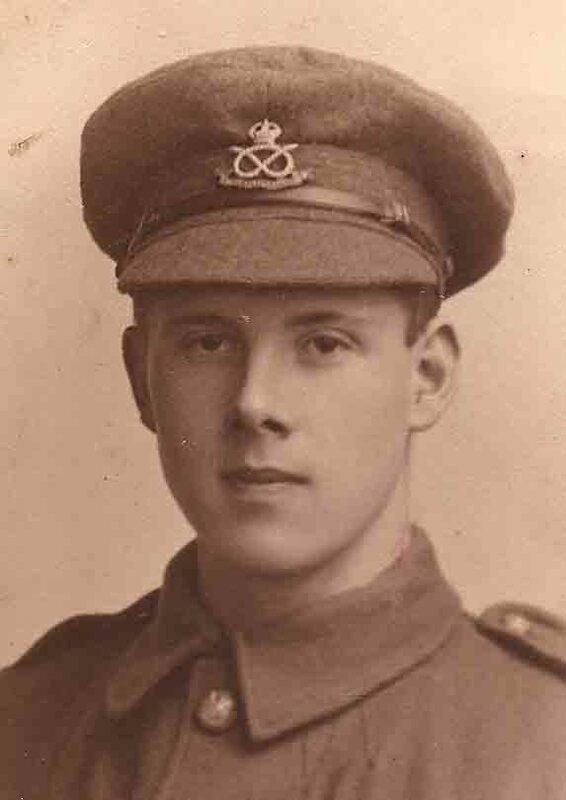 20th Birthday: 12th July 1915. Pte BERTIE HIBBETT: A Little Book of Words & Doings. Rheninghelps. ‘Mother’s Birthday. Sent card before, while in trenches. Went on fatigue at Yves Canal (Ypres)’ (1). Red Arrow: Rough Route of Staffords to the Front. 5th July 1915. Blue: Ypres-Comines Canal. LETTER to MOTHER, Marie Neal Hibbett, 95, Foden Rd. Walsall. Mother’s Birthday. July 13/ 15. Blessed is the man whom Thou choosest & receivest unto Thee. Evening Prayer Psalm 65. (2). It is evening & I have enjoyed a very nice tea with Mother’s lemon curd & the rest of the lovely cake. I was almost afraid I should not be able to get a line in today to wish you a very Happy Birthday for we have been out digging a long way off since five this morning & returned for tea. Happy that I have had the opportunity. So I hope you will have had a quiet & pleasant day & will have enjoyed a good night’s repose by the time this letter gets to you. What a lovely & nice one yours was, with Dad’s witty little line at the end. Yes, for Mummy’s sake, I hope to be at Home – sweet Home next year. Was my day fine? How flattered I felt when you said the flag would be flying. Flying too for Prince John (3). I am twice the age of the young prince, – what think ’bout that eh! I must thank Ida for her hurried letter & Dodger’s thoughtfulness in including Penning’s* letter, which we both read with interest. Have you, dear Mother, popped the lucky 6d in Dodger’s pocket? Is he keeping fit & not faint? (4). 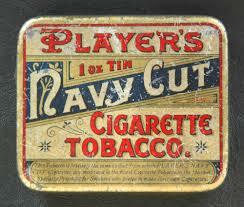 Oh what a chorus we shall both have now with the mouth organs – the cigarettes – well how generous you are. I think I at least ought not to have any more parcels for a jolly long time – these two ought to make up for a dearth to come. And above all to enclose a bit of cash too. I feel like you Mother. How can I express my gratefulness, after all it is only my duty that I am out here for I am sure I do not deserve such luxuries. Sydney came to my Bully Beef Bungalow & we both tucked into the ripping things, quenched our thirst with the chunks and cream. I am very sorry I shall have to be concluding for there is a rifle inspection soon & Mother would not like me to get into trouble. What nice Psalms they are for yours & my birthday (5). St George’s Church, Persehouse Street, Walsall. You remember the Bishop of Stafford (6) reading out the 4th verse of Psalm 65 at St. George’s Church (7) the year I was confirmed? It was on the 12th day & it snowed on our return home. I feel destined to enter in for Holy Orders. It will be hard I know to pick up Latin & Greek, but with His strong help I hope to get through. The Rev. Darling* said he hoped I should return safely so that I could teach his dear son Scripture – nice of him eh! And what did you have for tea on this your birthday? Harold’s parcel to us both was also ripping, but at the same time it looked as if a chemist had packed it (to his credit). Would you like to know what was in it? Well I will write again soon, but sorry I must stop now. Very best love & may our Heavenly Father give you more strength to bear your anxiety ‘little cross’ with more cheerfulness than ever. Mrs Jones* said you were surprisingly cheerful. Best love to all. Your affectionate son, Bertie. (1) Yvres/ Ypres/ Ieper Canal. (cf. Salient Map. July Welcome Page). (2) Psalm 65 v. 4 continues: . . . he shall dwell in thy court and shall be satisfied with the pleasures of thy house, even of thy holy temple. My father was confirmed at St George’s Church, Walsall and appears to have felt a calling to Holy Orders (as a priest) ever since. 3) Prince John was only 5 years younger than my father in 1915 (he was kept away from public eye and his disability was not made known until after his death, in 1919) cf.12th July Letter. 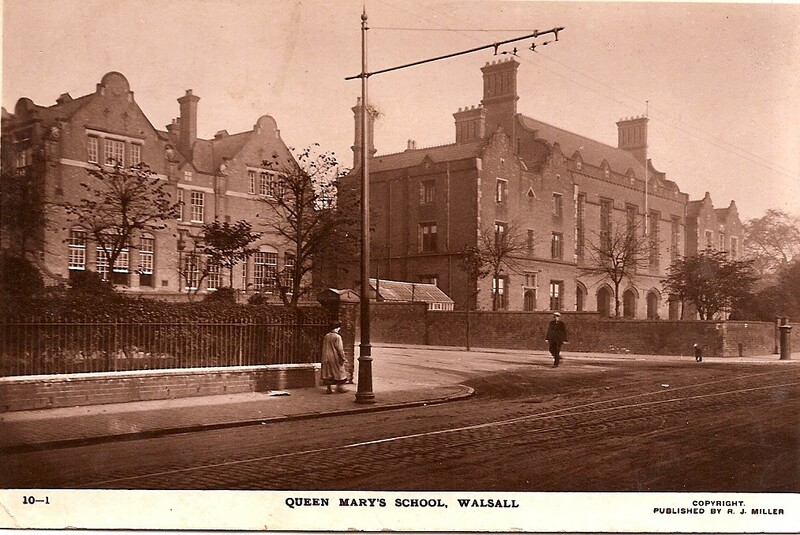 (4) Basil was about to take Junior Oxford Exam at QMS, Walsall. (5) Psalms 62-70 for 12th & 13th Day. Anglican Book of Common Prayer. 1662. Opening verses include: My soul truly waiteth still upon God; O God thou art my God: early will I seek thee; Hear my voice O God in my prayer: preserve my life from fear of the enemy; God be merciful unto us and bless us. (6) Edward Ware, 1846 -1915. Bishop of Stafford 1909-1915. 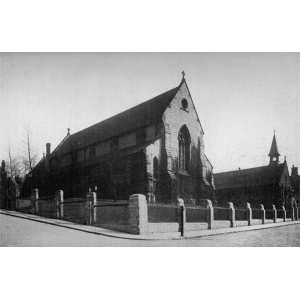 (7) St George’s Church, Persehouse St. Walsall (not far from 95, Foden Rd.). NEXT POST: 16th July, 1915: Pictures & Memories of Home. 20th Birthday Food Parcels 1915.Bishop of Stafford Edward Ware 1915.Bully Beef Bungalow 1915.Holy Orders.Khaki Socks 1915.Prince John 1905-1919.Psalm 65 v.4.Psalms 62-70.Rev E. More Darling.St George's Church Walsall.Yvtres Ypres Ieper Canal 1915. 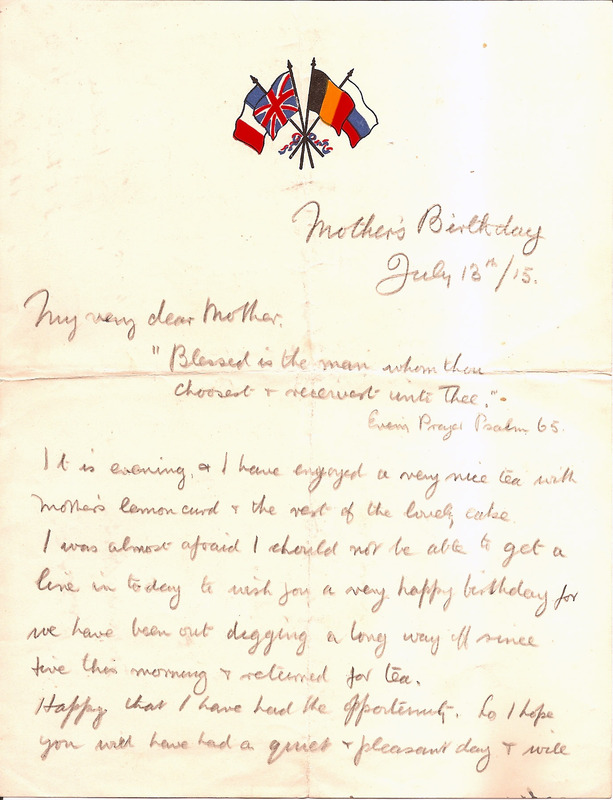 12TH JULY 1915: BERTIE’S 20TH BIRTHDAY RELIEF & ‘SAUSAGES’. 10th July, Sat: More enemy rifle fire than usual. 15 rifle grenades were fired into enemy trenches, 4 failed to explode. Enemy fired 6 rifle grenades, 3 burst short, 3 behind our lines (1). Patrol reports loose barbed wire in front of enemy’s trench opp. 50. Enemy working party observed in Redoubt in front of 50, another enemy working party behind their front line fired on and dispersed. Our Snipers doing good work. N.W. wind. CASUALTY: WOUNDED: No 7594 Cpl. Marsh G.H. 11th July, Sun: Two enemy Aeroplane (2) over our lines yesterday evening and one from 3.45 and 4.20 am. this morning. Enemy fired 4 trench mortar shells at 50. about 8.30 pm. damage slight. Retaliated with 16 rifle grenades, 7 failing to explode. Our guns also opened fire. Suspect enemy sapping towards 50 from new redoubt. Enemy have lowered parapet opp. A1 and A2. Snipers report accounting for German officer. Enemy shell burst over A5 Support about 10.am inflicting 6 casualties. Our artillery shelled wood opp. A5. Enemy replied by shelling Sanctuary Wood. CASUALTIES: KILLED No 7849 Pte J. Perry, 9014 Pte G. Fletcher. WOUNDED: 9131 L/Cpl. W.H. Kendrick, 7983 Pte H. Downs. 7822 Pte L. Norris. 9403 Pte C.N. Harriman. 9437 Pte W.R.Thomas, 9304 Pte G. Latham. 1381 Coy. Sgt. Major, C. Hawkins. 8197 Pte G. Thorne. 9316 Pte J. Booth. 12th July. Mon: relieved by 5th Bn NOTTS & DERBY about 1.15 am. In bivouacs at 5 am. WOUNDED returning from the trenches, No 7962 Pte E. Cadman. LETTER to MOTHER & FATHER, 95, Foden Rd. Walsall. The Z-Urban Dist. Trench Improvement Society. Tel. No: 40. Bully Beef Bungalow. 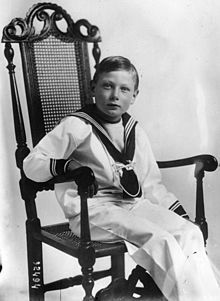 Prince John’s Birthday (3). July 12th/ 15. If we go forward we die, If we go backward we die. Better go forward & die. Gen. Baden Powell (4). How grateful I feel that I am alive & kicking & have come to see my 20th Birthday. We returned to Bivouac about five this morning after a very long march in full pack across lovely country & passed many different scenes (5). But we were tired & sleepy; I fell off to sleep on one of the rests. We had breakfast very soon after we arrived back & the rain it rained & the wind it blew. But now the weather is sunny & bright, yet there is the same wind. I had two small parcels while I was in the trenches. One on Sat. – the other on Sunday. On Sat I got some Mexican Chocolate (6) & Bachelor Buttons (7) from Bates*. He wrote to me about two months ago saying he would be willing indeed to act as shop keeper for me. Not wishing to be mercenary I jokingly suggested he sent a card of Bachelors Buttons. Eventually he took it quite literally & said he had been round to many shops before he could get them. Well I am surprised – or was on Sunday. I got two nice letters in one envelope from Auntie*, one written on the Ist. She said it was returned owing to omission of the Regiment. Enclosed also was a lovely khaki silk handkerchief with rich blue border. The parcel was from Okoo. I was looking forward to something nice inside such as cigs and chocs, but Oh dear I found two neatly wrapped boxes in white paper & sealed with red wax & some bandage. Don’t be inquisitive now! 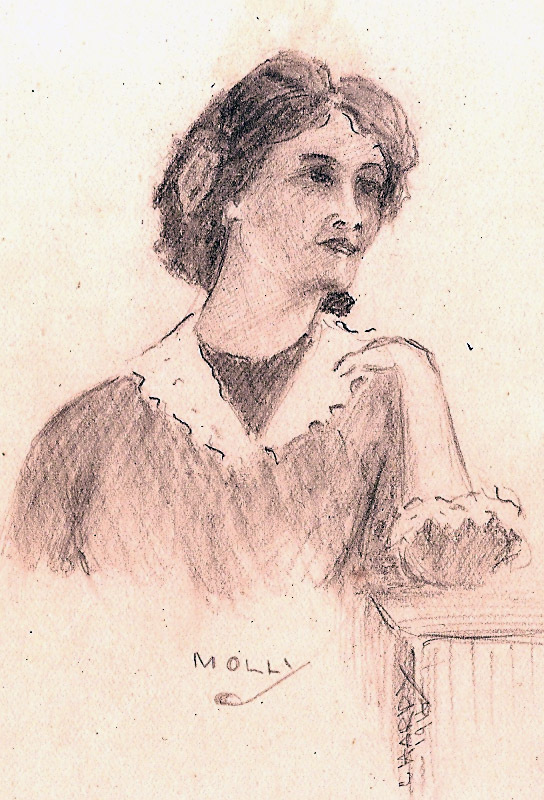 Molly Evans. Pencil Sketch by C. Hardy. 1916. (Bertie Hibbett’s 21st Birthday Album). I must tell you all some more about the interesting letters I read; one which Vernon handed me in mistake, but said I could read it afterwards. Well, Ida, she mentioned about the names on the bedroom doors & ‘mousehole’ in the box room – & Dodger, did they succeed in the tricks, especially the nightgown things (as Molly* puts it ‘cos she can’t spell pyjamas? I did feel flattered when my pictures were mentioned for exhibition in the monkey show. Yes the letters were saturated about the pleasant time the two had at No 95. 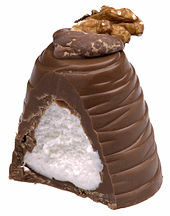 Mr Rowntree of York* went to Vernon’s house & his sister hoped he brought his trade with him namely ‘chocolates delect’. Norman, his younger brother, had been to the Royal Show at Nottingham. I mentioned I was in some way intimate to the two facts ahem! You must, dear Mummy, get the Observer & read about Rowntree (8 &9). There is one unique coincidence with regard to ‘No 40’ – ‘A’ Company touched for what we thought would be a squeamish position – i.e. 40 yards from the enemy. On the night of relief – i.e. Sunday – they threw what we call ‘sausages’ (10) into our trench. You can see the sausages coming & are more prepared for the fall than when a shell comes. A mine also blew up and we all ‘Stood To’. Half thought we should have to cancel the relief & stay the night in the trenches. Then ‘No 40’ comes in again with regard to the rumour of the length of time we shall be in the trenches next time after our 12 days rest in bivouac. We are going, ‘they say’, to that place you have heard of that Ida wanted to know if we were anywhere near (11). I want you to get this letter, so I had better not go too far in giving the show away. Mr. Frank O. Bates’ House, Aldridge, Walsall, Staffs. Watercolour signed STB? Well, dear Mummy, I will conclude my letters with love to you. I wish I could ride to Aldridge again. Mr Bates* said his roses & strawberries were in fine growth & he wished he could send me some. Do you remember the tea party on the lawn when you were so generous as to lavishly buy cakes & biscuits for the scholars’ tea & the maid came to serve the mites? And does Basil remember the little man & how the scholars liked the evening so much that they were not too keen to go home? (12). Got your two parcels today & enjoyed a good tea with Syd – will tell you more about today next time I write, but want to get this off by this post. Pte Bertie Hibbett’s relief at seeing his 20th Birthday after what was probably his worst week is paramount – and reflected in his use of ‘dear Mummy‘. (1) Hales Rifle Grenade: Martin Hale, 1907, a hand-grenade attached to a metal rod and inserted into the rifle barrel/ had range of 150 yards. (Not available to British Army until 1915. See also ‘Mills Bomb’ wikipedia). Pte Bertie Hibbett experienced them ‘40 yards from the enemy’. (2) Reconnaisance and/or Fighter Aeroplanes. (3) Prince John Charles Francis. Disabled/ epileptic youngest son of George Vth, b.1905 d.1919 aged 14 yrs. 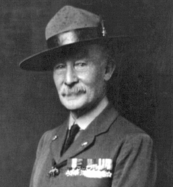 (4) Robert Stephenson Baden Powell, 1857-1941. Mafeking Hero, Boer War 1899-1900. Letter from Baden-Powell to Mr. Hibbett. 1927. Founder of Boy Scouts, educational innovator, promoting citizenship though outdoor activities. Much admired by my father who helped with Scouts when Curate at Alford, Lincolnshire, 1920s. ‘Doing good & helping others’. (5) ‘Different Scenes‘: my father plays down the dangerous trek back from the ‘New Trenches‘ after such a ‘relief‘ & so many casualties. (see Map of Route. Letter 9th July.1915). (6) Mexican Chocolate: Advert.‘ British Chocolate for our Soldiers at the Front. Offer of Cadbury’s. To mail direct post free. Tin containing g four cakes of famous Mexican Chocolate &1Ib tin of cocoa & milk powder. Total Cost 3 shillings & 6d.‘ The Argus. Oct 28th 1915. (7) Bachelors Buttons: Not sweets (as 1st thought) but suspender buttons sent by Mr Bates, Aldridge. (8) Arnold Stephenson Rowntree, 1872 -1921. Chocolate manufacturer, Quaker & Liberal MP for York, 1910. Involved in: Fellowship of Reconciliation (inter-denominational Christian group promoting pacifism 1914); Friends War Victim Relief; Quaker Meeting for Sufferings (led to creation of Field Ambulance Units); Military Service Act,1916 helped amend provision of conscientious objectors). Vernon’s father, Enoch Evans* as Mayor of Walsall 1921. ‘where I stayed with a nice Conservative solicitor, Mr. Evans . . . got on nicely and after an early lunch Mr. Evans’ son motored me to Birmingham‘ for Quaker Peace Talks. (9) NB this ‘son’ would have been Norman Harrison Evans* (age 13, no age-limit/ driving test needed). NEXT POST: 13th JULY, 1915. Mother’s Birthday. 'Sausages' /slang Rifle Grenades.5th Bn Notts & Derby.Arnold Stephenson Rowntree.Bachelor Buttons.Baden-Powell.Bertie Hibbett's 20th Birthday.Bournville at Uffculme.Enoch Evans Solicitors Walsall.Fellowship of Reconciliation.Field Ambulance Units.George & Henry Cadbury.Hales Rifle Grenades.Mexican Chocolate.Mines.Prince John 1915.Quaker Peace Talks.Rowntrees whipped cream.Snipers.Stand To. 9TH JULY 1915: MOTHER COURAGE: WOULD-BE CAMP STALL-HOLDER & POSTMISTRESS. ARMAGH WOOD TRENCHES 1 mile E. of Zillebeke. 6th July,Tue: A Bombing party of 3 Germans approached our lines near to left of 6th South Staffords and were fired upon. Two men only observed to return. Small party of enemy observed in front of A1 trench, reconnoitring our line, were fired on. CASUALTIES: WOUNDED No 8105 Pte W. Barlow; 9948 Pte H. Stott slightly wounded. 7th July,Wed. Patrol went along old Communication Trench in front of 50 trench and got within 20 yards of enemy redoubt, heard enemy moving about and found enemy wire in bad condition. CASUALTIES – KILLED: 7894 Pte G. Dyke; WOUNDED: 8624 Pte H. Carless; 8372 Dr A. White slightly wounded. 8thJuly,Thur: Our snipers fired with effect on German working parties. At 10.30 pm Bombing Party threw two bombs into enemy redoubt opp. 50 trench also Rifle Grenades fired at same point at 11.00 pm. Otherwise all quiet. CASUALTY: WOUNDED: 8913 Sgt Bendall S. accidentally wounded. In the New Trenches. Friday July 9/ 15. Marie Neal Hibbett 53 in 1915. Photo 1920s? Sydney let me have your letter to read, written on 4th. Sorry it was not such a pleasant Sunday as I hoped it would be. What a beautiful thought it was of you, dear Mother, to think of coming & taking on as a stall holder outside our camp. As for taking over the postman’s duty I should love to have a photo of you with the big bag over your shoulder. I say Mum I do feel mad. Vernon came up to me yesterday morning & asked me, in a sort of casual way, when my birthday was. I said I didn’t wish to tell him but with his usual persuasiveness he got it out of me, bit by bit. He said he’d got a bet on with somebody. To that I replied ‘well a bet aint all that important’. Then he began to guess the date – starting from 14 -15 -13 –12 – so he ‘had’ me at last. But I ‘had’ something for him. I tried to make him promise to keep it quite to himself, but to this he said he’d asked me for a purpose. I must confess I have a weakness for keeping my own (birthday secret). Later in the day Vernon gave me a letter to read; it turned out he had given me the one he did not intend giving me. It was full to the brim about the two girls going to our house – all about stitching Dodger’s pyjamas up & any amount of personal matter with regard to meself. Vernon afterwards gave me the ones – i.e. from Molly*(2). She said jokingly that my pictures would take 1st Prize for the monkey show & so they would. All the letters were very nice indeed & written just like Ida composes, not booky & essay sort of style. There was a sketch of Basil’s pyjamas in one of them. I write this letter hoping you will get it on your birthday (3) to wish you a happy one & many Happy Returns. We were paid 5 francs, a week last Thursday, so I went into the nearest village (4) where there is a shop full of soldiers buying & I got you this card, & while looking at the assortment, I saw one of some lilies done in white & green silk. I thought Ida would like it for her bedroom. I can’t quite understand Dodger giving up all thought of going to George (5) now this thing is on (6). I hope if he does go to any munition factory he will take on what he likes best after he has served his time in munitions – i.e. farming I suppose. I will close now & try & go to sleep for I am on duty this afternoon. I wish I could cycle to Aldridge (7) & get you some more of those roses. Do you remember last year’s? PS NB You will tell us how Dodger fares in the exam. won’t you? PPS Later in day. Had a very nice letter from Miss K. E. Brookes* which I will tell you more about in next letter. Censor: J.A. Allday. To reach the ‘New Trenches’ at Armagh Wood, Pte Bertie Hibbett & his QMS pals must have followed the same dangerous five-mile route taken by the 5th Leicestershires, whom they were to relieve, 5th July, 1915. 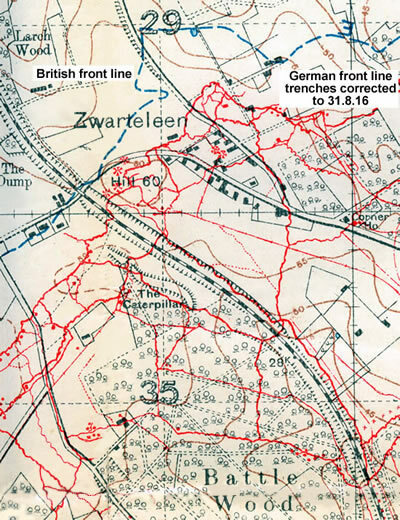 Rough Map of Staffords’ Route to the Front, 5th July 1915. efw 2015 from various sources. Red dotted line is 1915 Front Line. Black dotted Line is 1914 Front Line. From Ouderdom Farm, they took mud roads & cross-country tracks over the plain to the Indian Transport Field, near Kruistraat White Chateaux and on passed the Brigade Head Quarters Chalet to the outskirts of Ypres. 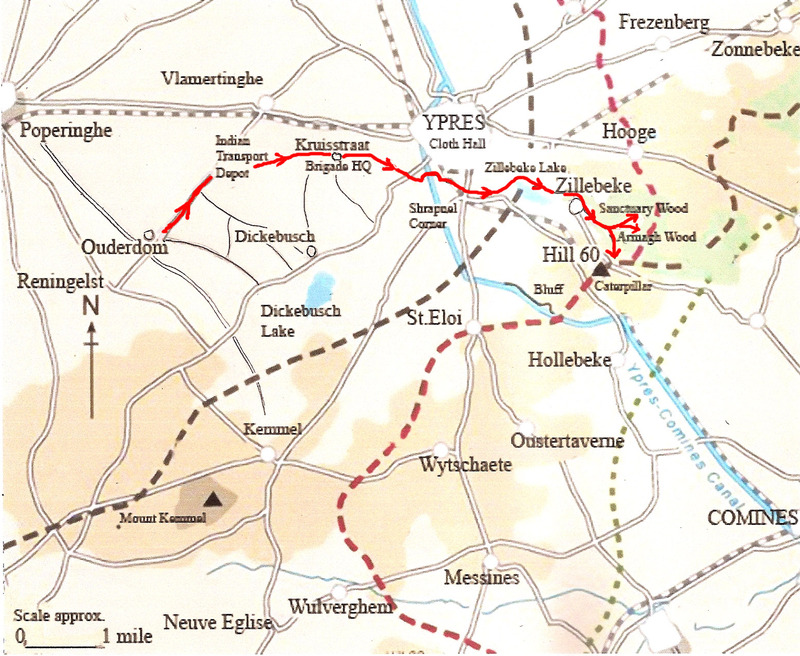 Field tracks then took them over the Ypres-Comines Canal at Bridge 14 and across the Lille Road, a few yards north of the notorious Shrapnel Corner – and on to the White House at the NW corner of Zillibeke Lake. The route then followed the north side of the Lake where a trench cut into a high causeway) gave cover from observation on Hill 60, until they came to Hellblast Corner at the tip of the Lake. At Zillebeke they would have crossed the the main road at the double (to avoid the German machine gun on Hill 60). On passed the Church ‘another unpleasant locality‘, they took another track to Maple Copse, with a turning left to Sanctuary Wood & the Ration Dump and right into Armagh Wood. The Staffords were subjected to ‘heavy shelling during relief’ and lost one Private killed and one Lance Corporal wounded. Their return on 12th July took nearly 4 hours. (1) Cecil Jackson*. QMS school pal, Walsall. (2) Molly Evans*. (3) Mother’s Birthday: 13th July. (4) Reninghelst, 1 mile SW of Ouderdom. (5) George Lallerman* farmer? Ida’s friend for many years. (6) The Shell Crisis of 1915. 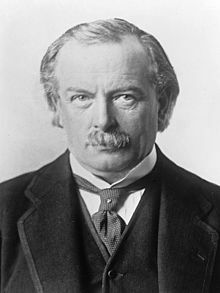 On 6th July, 1915, Lloyd George called for more munitions workers; country running out of shells. (7) Aldridge garden of Mr Bates*, renowned for his roses. [ Aldridge: in 1915, a village 3-4 miles NE of Walsall, parish also includes village of Great Barr]. NEXT POST: 12th July 1915. 20th Birthday Tea & no ‘sausages’. Bertie Hibbett's 20th Birthday.Bombing Parties 1915.Lloyd George & Shell Crisis 1915.Mother Courage.Reninghelst.Rifle Grenades.Snipers.Souvenir Cards WW1.WW1 Camp Stall Holders. 5th JULY 1915: ‘Z’ URBAN DISTRICT TRENCH IMPROVEMENT SOCIETY ON ONE CUP OF WATER A DAY! 5th July, Mon. In Bivouac. Proceeded to Trenches 49, 50, A1, A2, A3, A4 and SPD in front of Armagh Wood to relieve 5th Leicester Regt. Heavy shelling during relief. CASUALTIES: KILLED: No 9571 Pte J.D. Allen; WOUNDED: 8755 L/Cpl G. Hewitt slightly wounded. 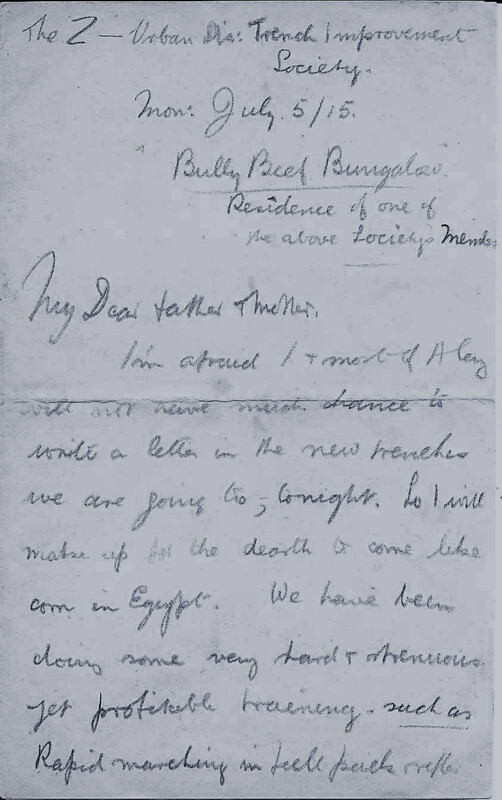 Pte BERTIE HIBBETT: LETTER to FATHER & MOTHER, Arthur & Marie Neal Hibbett, 95, Foden Rd. Walsall. The Z – Urban District Trench Improvement Society. Bully Beef Bungalow – Residence of one of the above Society’s Members. Mon. July 5/ 15. I’m afraid I & most of ‘A’ Coy will not have much chance to write a letter in the new trenches we are going to tonight. So I will make up for the dearth to come like ‘corn in Egypt’ (1). We have been doing some very hard & strenuous, yet profitable training, such as Rapid Marching in full pack & rifle in jolly, jolly sweaty hot weather & rapid firing in standing position in full pack. In fact it is an order to have six hours training in full pack every day in Camp. Very trying, but the lovely sunny evenings make up for the work. We have a fine field for the Bugle Band to play the Tattoo & the Brass Band gives us the best of music now & again. We have just come off parade – it’s about 11.00 & we are having a rest today for the reason ‘before mentioned’. So the Brasses, Trombones, Euphonium & all the other instruments are keeping in fine time with the Bandman’s baton. The heading to this letter was introduced in the Colonel’s speech about us going to the trenches. We have gained creditable reputation from many officers, Generals etc. included. Our trenches at the place we have left ‘are a Model to the British Army’ so said one to our Colonel. ‘You are a jolly lucky fellow to have such men under you’ said another, & there were many other praises I’ve forgotten. I will pause now & pop a Rowntrees Walnut Cream (2) in my mouth – sent in a parcel from Auntie. Mother, I went to Holy Communion yesterday at 6 – sunny evening, but close. The little altar was laid under a tree. The Chaplain gave the little body of men present a very encouraging & comforting address on us going into the trenches – & suggested the Collect for St Michael & all Angels as a fine prayer (3). Water is scarcer still here, in fact we have to buy it & we can only have a cup-full served out to us in Camp each day (4). Tell Basil the Band has played that well known piece which reminds me of the Picture Palace – Valse Septembre (5) & (6). I guess Sydney will be writing too, he is in the hut about 3 or 4 down. I am exhausted of news now so will close, hoping you are keeping well. How goes the garden? I remain a member of the Z. U. R. D. Trench Imp. Soc. Bertie. At Ouderdom, the Army did its best to prepare the Staffords for their most trying ordeal yet. The Colonel proudly praised their reputation earned at Wulverghem; the Chaplain comforted them with thoughts of angelic protection; the Bandsman jollied them with good tunes; and the Serjeant Major drilled them relentlessly for the five-mile march to the Front (the notorious Shrapnel Corner & crossing at Zillebeke must be taken at the double in full pack). No ‘light duty‘ then for my Dad’s poor feet. (3) Collect for St Michael & All Angels’ Day: Sept 29th: O Everlasting God, who hast ordained and constituted the services of the Angels and men in a wonderful order; Mercifully grant that, as thy holy Angels alway do thee service in heaven, so by thy appointment they may succour and defend us on earth; through Jesus Christ our Lord. Amen. Book of Common Prayer, 1662. (4)Water ration: one cup a day (5 Belgian francs?). (5) Electric Picture Palace: Lower Bridge Street, the first purpose-built cinema in Walsall, opened 12th April 1912 (closed during WW1). (6) Valse Septembre, 1909: Henry Albert Brown 1854 -1925 (alias Felix Godwin), English composer of light music. Used in film ‘Titanic’ 1997. NEXT POST: 9th July, I915. Update July Welcome Page. Full PackPicture Palace Walsall.Rapid March in full pack.Rowntrees Walnut Cream.Shrapnel Corner.St Michael & All Angels Collect.Staffords a Model to the Army.Valse Septembre.Water Ration.Zillebeke.